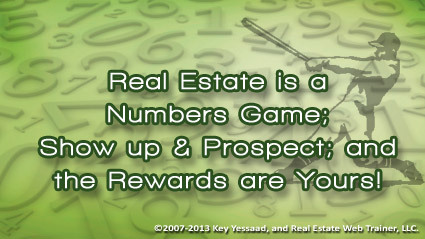 When you think of Real Estate think of Baseball, well; at least in terms of Statistics; Real Estate is a Numbers Game. The 2012 Baseball Major League Batting Average was .254, which simply translates to: the best players in baseball hit once for every 4 trips to the mound (at Bat.) What some people miss is the fact that in baseball you miss more than you hit, and that is ok; you just need to show up more often to the mound and work to connect once in four attempts and you are a major league baseball player. I know, this is an oversimplification, but you must think of Prospecting in terms of Statistics; you are not looking to get a Yes from every person you talk to; in fact you are supposed to get a lot of No’s; and if you manage to stick it out with good scripts – One Yes for every 20 No’s, you will become the top listing agent in your town; that’s right 1 Yes for every 20 No’s and you have created an amazing lucrative career in Real Estate; think about that!